Well-know British weekly, The Economist, has created flutter by publishing United Nations Children Fund's (UNICEF's) unpublished data which suggest that Gujarat's ranking in immunization of children has slipped from 16th to 21st position between 2001, when Narendra Modi came to power as state chief minister, and 2014, when he became India's Prime Minster, "riding" on a developmental agenda. The Economist believes, "It seems possible that data were held back for political reasons, to avoid embarrassing Modi". The data have been revealed (see attached chart) in the The Economist's print edition dated July 27 in its report titled "India's health data: Sparing Mr Modi's blushes", with a sub-heading "Missing data should embarrass the prime minister." 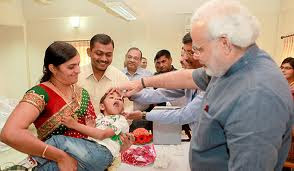 Pointing out that "the full set of figures on immunization rates, obtained by The Economist, suggests a striking lack of progress in Gujarat under Modi", the weekly says, "Just after he took office in 2001, 54% of children were being fully immunized against preventable diseases—well above the national average of 46%." 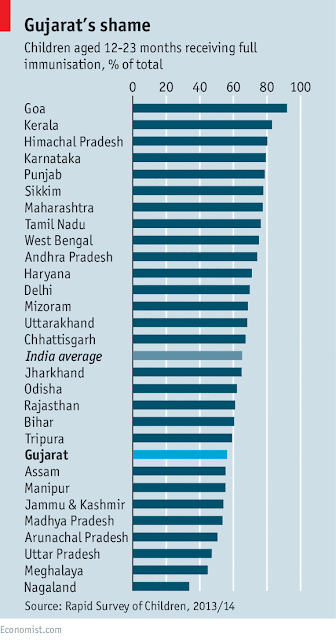 At that time, "Gujarat was 16th best of 31 Indian states and territories assessed." "By 2014 when he left there was only a tiny improvement, to 56.2%, far below the national average of 65%. Gujarat’s rank had fallen to 21st of 29 states surveyed. Most remarkable, it was behind even notably poor and backward states such as Bihar", the influential weekly says, releasing the unreleased data. The Economist reveals, "One indicator of the strength of a health system is how many of those who get a first dose of a vaccine fail to get subsequent ones. The new survey suggests that wealthy Gujarat’s dropout rate for the polio vaccination is almost 21%. The national average is 12%." The Economist says, "A countrywide survey involving 200,000 interviews was conducted in 2013 and 2014 by UNICEF and the Indian government.The results should have been published in October 2014. A limited set of data, on immunisation, was released the ministry of health. It covered most large states, but figures on Gujarat, oddly, were excluded." The Economist comments, how Modi, who ruled Gujarat for a dozen years, called Gujarat a model state to come to power in India, boasting "that incomes there were among India’s highest". It adds, "He dismissed critics who said he was neglecting health and social policy." In fact, he brushed aside critics by "explaining how Gujarati women suffer high levels of malnourishment because they are beauty-conscious and refuse to eat." The Economist goes on to comment, "As prime minister, just as previously, Modi has paid scant attention to health. Overall spending by the central government on health and education, already low, has been cut. Modi prefers to let individual states take charge. His record in Gujarat suggests that approach is flawed."